In a recent publication, Soares & Shetty (1991) compared the BMRs of physically fit, apparently healthy, adult males from two different socio-economic groups. Those from the lower socio-economic groups (in both rural and urban areas) were significantly shorter than individuals from the upper socio-economic groups. Subjects from both socio-economic strata were classified on the basis of BMI into those above a cut-off of 18.5 and those below (Table 1). The absolute BMRs (in MJ per day) were low in all groups with BMI <18.5 as compared to those with BMI >18.5 irrespective of socio-economic status. The BMR corrected for body weight or FFM differences showed that those with BMI <18.5 had significantly higher values than well nourished urban males with BMI >18.5. Low body weight adults and therefore a low BMI have BMRs per kg FFM which are higher than those with a high BMI. This feature of a higher BMR per unit active tissue has been seen earlier in several studies on adults (Kurpad et al., 1989; Piers, Soares & Shetty, 1991), in malnourished school children (Spurr, Reina & Barac-Neito, 1986; Spurr & Reina, 1988) as well as in malnourished patients (Roza & Shizgal, 1984). Srikantia (1985) has also reported a higher BMR per kg body weight in individuals with a low weight-for-height. On the basis of these observations it has been argued that the demonstration of the existence of metabolic efficiency is erroneous on the basis of changes in the index BMR/ kg FFM since these changes may reflect alterations in body composition of the individual (Shetty, 1993). Such a normalization procedure as expressing BMR per unit weight or FFM is now believed to be mathematically biased and invariably leads to the conclusion that individuals with smaller body weights or FFMs have higher BMRs per kg body weight or FFM compared to their heavier counterparts (Ravussin & Bogardus, 1989). Erroneous conclusions regarding such changes can be avoided if a new group's data is subjected to analysis of covariance (ANCOVA) by adjusting for weight or FFM between groups. Soares & Shetty (1991) showed that the CED subjects from lower socio-economic strata with BMI <18.5 have a significantly lower BMR (Table 2) which may be indicative of an apparent increase in 'metabolic economy' of the tissues of these CED individuals (Soares & Shetty, 1991). However, the more interesting feature is that a group of urban individuals from upper socioeconomic strata, with access to adequate energy and protein intake but with BMI <18.5, have BMRs which are lower in absolute terms (Table 1) but show no evidence of an enhanced metabolic economy, unlike the CED subjects with a similar BMI. *Adjusted by analysis of covariance using weight or FFM, in turn, as covariates. aStatistically significant as compared to upper SES > 18.5 (urban). bStatistically significant as compared to upper SES > 18.5 (rural). cStatistically significant as compared to upper SES < 18.5 (urban). BMR = basal metabolic rate; FFM = fat-free mass. All values are mean + SEM. *Grading of CED based on BMI cut-offs suggested by James et al. (1988). Adjusted using ANCOVA with FFM as covariate. aStatistically significant vs BMI > 18.5 upper SES. bStatistically significant vs BMI > 17.0 upper SES. cStatistically significant vs BMI < 17.0 upper SES. FFM = fat-free mass; BMI = body mass index. This raises the question whether it is true that all individuals with BMI <18.5 are CED, a matter considered by James et al. (1988) when they proposed the dual classification system for CED using BMI cut-offs and physical activity ratios. Lower limits of acceptable BMIs depend not only on the fat mass and FFM of an individual but also on the level of physical activity which would enhance their energy turnover. The likelihood of thin, tall, physically active adults having a lower than optimum range of BMI and presumably having normal or adequate energy intakes has been recognized since even the NCHS data on adults suggests the presence of a reasonable number of underweight (BMI <18.5) but not necessarily undernourished individuals in a community (Abraham, Johnson & Najjar, 1979). Using the data of Soares & Shetty (1991), the relationship between body weight and BMR (Fig. 1) and between BMI and BMR (Fig. 2) has been re-examined. It is evident from the two figures that underweight individuals (BMI <18.5) from upper socio-economic strata show identical relationships for both body weight and BMI to those of normal weight (BMI >18.5) from similar socio-economic strata. There appears to be a continuum over the body weight range across the BMI cut-offs used to classify CED. The CED subjects (also with BMI <18.5 but from lower socio-economic strata) have a relationship for weight and BMI to BMR which is distinct and separate from those from the better socio-economic strata. Since the relationships of body weight to BMR would be different in these groups, the BMR predicted would be different too, and thus the estimates of energy requirements would also vary significantly although two individuals may have similar BMIs though not similar body weights. For example, it can be shown, using the relationships predicted from the data of Soares & Shetty (1991), that the energy requirements of a 50 kg moderately active male (with BMI <18.5) will be identical to that predicted by the equation derived from data on well-nourished adults (BMI >18.5) if the male comes from upper socio-economic strata, but in men of the same weight from a low socioeconomic group it will be -12% lower. These observations also strengthen the statement that all individuals with BMI <18.5 need not necessarily be CED on the basis of a simple operational classification more recently proposed for population estimates of numbers of CED (Ferro-Luzzi et al., 1992). Fig. 1. Relationship of basal metabolic rate (BMR) to body weight. CED = chronic energy deficiency. Fig. 2. Relationship between basal metabolic rate (BMR) and body mass index (BMI). CED = chronic energy deficiency. Estimates of energy requirements of a moderately active male calculated using the factorial method from (a) predicted BMR or (b) measured BMR show that the requirements can also be significantly lower if the individual is CED and from lower socio-economic strata compared with an underweight from upper socioeconomic strata, although both have identical BMIs. For instance, the energy requirement of moderately active adult males aged 18-29+ years would be 10.5 MJ per day for a well-nourished person but only 9.0 MJ per day if the individual was CED, although both had the same BMI. It is evident that CED individuals who also have a shorter stature, perhaps as a result of a poor food intake since childhood, will have lower body weights for the same BMI value. Estimates of energy requirements would thus not only be influenced by the BMIs of the individual but also whether the individual with the low BMI is in fact from a poor environment, of shorter stature, is metabolically different and has a different body composition. The Fifth World Survey (FAO, 1985) has proposed that maintenance requirements should be taken as 1.4 × BMR. This incorporates ~3 h of activity while standing and will include washing and dressing activities, but not occupational or socially desirable activities. Table 3 summarizes the maintenance requirements of adults (aged 18-29 years) both males and females, of different stature and of different BMIs within the desirable range of 18.5-25. Changes in body weight as related to height, i.e. underweight or overweight, can affect the estimates of energy expenditure and hence energy requirement since the BMR, whether predicted or measured, is related to body weight. Under these circumstances deviations of actual body weight from what is 'appropriate' or 'desirable' for that height will influence the estimates of energy requirements although defining the term 'desirable' or 'appropriate' weight-for-height is not easy. A BMI of between 20 and 22 kg/m2 can be considered as being optimal on the basis of the association between life expectancy and BMI in developed countries for both males and females (Bray, 1979). Levels of physical activity (sedentary, moderate or strenuous) will also have to be added to maintenance requirements calculated at 1.4 x BMR. In the case of individuals who tend to be sedentary, allowances have to be made for a minimal level of desirable activity for maintaining physical fitness. Maintenance requirements are defined as equivalent to 1.4 × basal metabolic rates of adults aged 18 to 29+ years. Longitudinal changes in both body weight and BMI occur in an individual within a population over time and with age. A recent report by Casey et al. (1992), which followed up a group of men and women over a period of 30 or more years, showed that the BMI increased from 21.3 for men and 20.7 for women at age 18 to 27.5 and 26.1 at age 50. Such changes in weight and BMI will alter the energy requirements since increases in body weight will increase BMR. The increased requirement is >10% in both sexes even if the person has a sedentary life style. However, a reduction in BMR with age is also well recognized (Davidson & Passmore, 1966) and this in turn may compensate for the estimated increase in requirements based on body weight. It is thus likely that age-related changes in adulthood also influence the energy requirements of an individual. The changes in the age profile of a population will thereby also change. Within a population, secular changes in the population profile may also be important. It is widely recognized that in many countries children are growing faster than several decades ago. There are also population changes in adult height, in body weight and BMI. The influence of a higher life expectancy and a lower birth rate will alter the population structure of a country. All these factors will influence the BMR and hence the energy requirements of the population whether of developing or developed countries. James & Schofield (1990) in their manual for planners and nutritionists set out how each of these changes in a community influence the estimates of energy requirements. Fig. 3. Projected food needs of the Indian population. Energy requirements of populations are in turn used to estimate national food needs, which in turn have enormous influence on agriculture and food policies. The foods needs of a country can be projected taking into consideration the various allowances recommended by the international consultation (FAO/WHO/UNU, 1985). Figure 3 shows that the food needs of a country such as India estimated for 1985 based simply on current estimated stature, body weights and hence BMIs and level of physical activities of adults and children would be ~30% below the desirable intakes of energy should the general population be of a stature either similar to that of Northern Europe or the smaller affluent subsection within the country who have been and are well fed with statures close to that of NCHS standards. 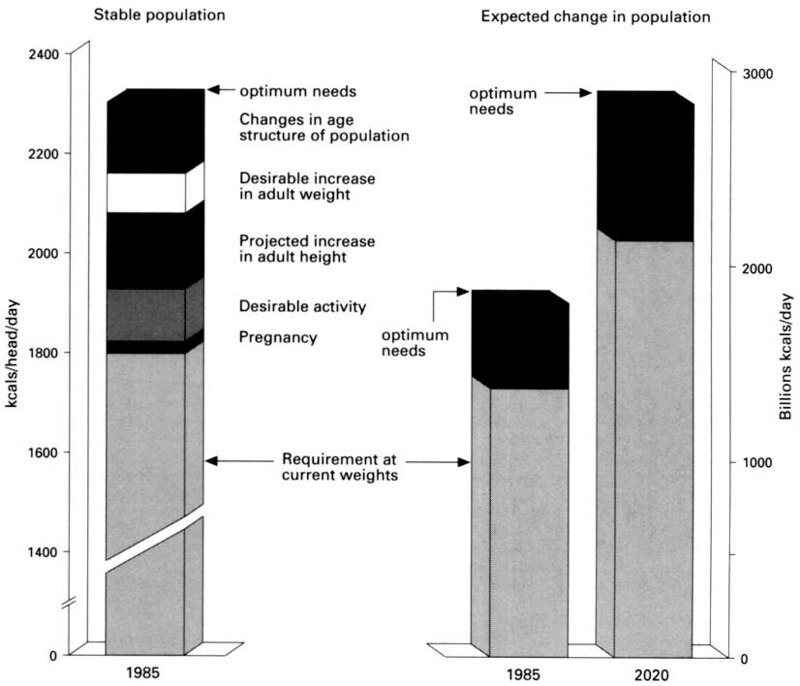 Figure 3 shows how the requirements at current weights are far short of optimum needs should projected increases in adult height and projected increases in adult weight appropriate to height and hence normal range of BMI occur; it also shows how, at current rates of population growth in India, the projected food needs of the Indian population, both based on current body weights and optimum needs, assuming projected increases in body weight, stature and BMIs, can show phenomenal increases which may make remarkable demands on its land and food production.